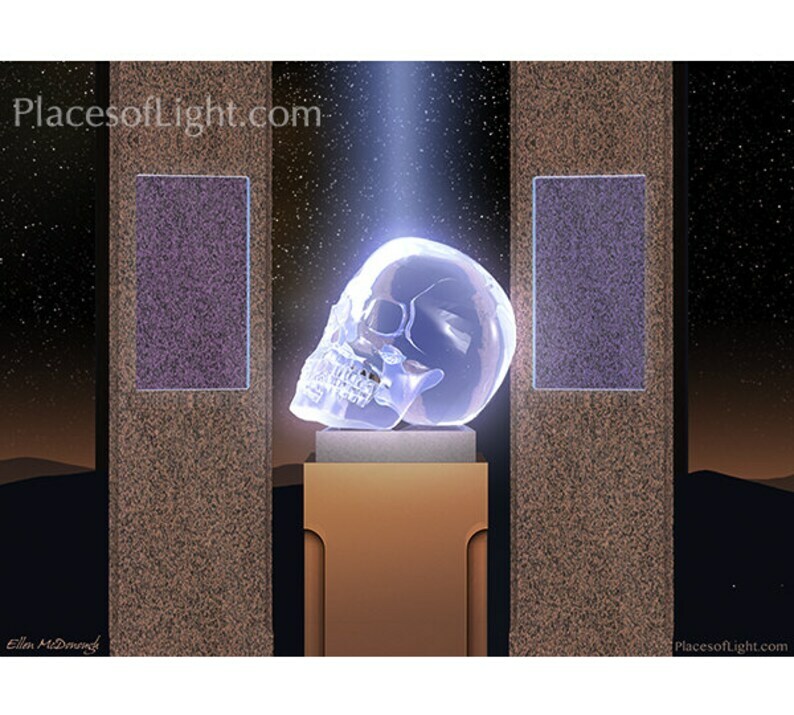 Beautiful, colorful art print "Crystal Skull", which shows a crystal skull in a mystical temple. Item is printed on quality, semi-gloss Archival paper. Great gift for anyone who loves sci-fi art!! Print is signed by me, Ellen McDonough, on the back. In Atlantis' golden age, crystal skulls were created with sound, light & frequencies, via technology far beyond what we have today. High consciousness was embedded in the crystalline matrix, securing Atlantean civilization in a high awareness. One day soon, all the crystal skulls will be reunited, raising Earth to the same level of consciousness, bringing Light, wisdom and peace to us all. Very impressed with the quality and stunning art of this purchase! Absolutely gorgeous ! Fast delivery and delivered beautifully packaged . Seller is an excellent communicator as well! Thanks ! Order was shipped and received promptly. The coasters are well designed and will not only be a great conversation piece with guests, but will also provide positive energy with every use! Loved the coasters. It is a gift and they will absolutely love them. Very pretty and made well. Thanks you!! I’m delighted to receive such a beautiful journal. Thank you! I accept major credit cards as well as PayPal. Please contact me if there are any problems with receiving your order. I appreciate your business and I will always do my best to resolve any issue. If you're not satisfied with your purchase, you may exchange the item for another within the same category within 30 days. You are responsible for the shipping costs for returned items. However, I ask you first contact me to let me know that reason for the return. Prints are on quality, semi-gloss E-surface paper; mats are acid-free. Matted prints come with a cardboard backing and are enclosed in a clear plastic cover. I also offer larger sized prints, as well as canvas-wraps. If you are interested, please contact me for more information.